It’s been thirty years since The Princess Bride! Celebrate with us with this classic article about a classic movie. How do you explain The Princess Bride? You could try describing the action in it, but it’s a long list. As Grandpa notes in the beginning, it has “fencing, fighting, torture, revenge, giants, monsters, chases, escapes, true love, miracles…” But like Grandpa (and like the marketing department responsible for selling the masses on the film) you might have trouble explaining it in a way that truly captures its comedy, romance, action, fantasy, beauty…oh, and now I’m doing it, aren’t I? In the 30 years since the film’s release, millions have people have done that exact thing – sharing it with friends and family – and now The Princess Bride is a cult classic with legions of rabid fans. But how did it capture our imagination so clearly? The world of The Princess Bride is a simple one, and that’s one of the most endearing qualities of the film: it’s a standard fantasy epic, with its tongue planted firmly in its cheek. The themes are played with by the creators, but the truths hidden behind them are very profound. For instance, the film begins with an idyllic location, a man, and his true love. Though she is abrasive, demanding, and cruel, Westley continues to love and serve her until her harsh calls of “farm boy” become a soft, loving “Westley.” In a sense, he loves an unlovable woman until she becomes beautiful. The picture of God in Ezekiel 16 is of a lover who lavishes His bride until she is beautiful enough to be His wife. Despite her wallowing in blood, despite her brokenness, despite her death, He is willing to pour Himself into her. It really draws a stark line between God’s design and our experience in this broken world. We expect love to come as a result of beauty, but God switches the cause and effect: we are beautiful because He loves us. Under His loving care, our focus changes from ourselves to Him; and through that, we are made beautiful. But a perfect world is no more likely at the beginning of a fantasy story than it is in reality. Westley is captured, and soon, Buttercup gives in to unfaithfulness because of fear. Like Buttercup, God’s people gave into their fear and were bitterly wounded as a result. God’s bride gives up her true love for a lesser love, settling for someone who will not and cannot satisfy her, because she is afraid that He is not enough. The entirety of the Old Testament in the Bible is an account of what happens when His bride does not count God as enough: as the grandfather says, emptiness consumed her. This is no accident or oversight. God made us to desire Him, and nothing else can hold water. Like Buttercup’s daily ride, the things we do only fill that emptiness temporarily. It’s the curse of life in this fallen world. Westley loves Buttercup too much to let her go, though, and God is far more faithful even than that. Despite our rejection, He pursues us! (Ezekiel 16:59, Jeremiah 31:3) God loves us too much to leave us alone. Not that we make it easy for Him. Like a skilled Spaniard, we try to do things to earn entry into His kingdom by our own power; like a strong giant, we try to avoid sin by sheer force of will; like a smart Sicilian, we think up silly arguments, reasons and loopholes why we don’t need him. Our pride is easily swept away by the love of the Father, and He defeats each of us. Our lover will and does capture us. No matter what we do, He will pursue us. 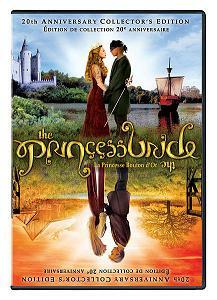 In the film, Buttercup turns away from Westley three times, yet he still pursues her unto his own death. And despite our many rejections of Him, our Lord still pursues, conquers, and dies for us. And He rises again, saving us from the unfulfilling life we chose and destroying the warthog-faced buffoon of sin that has so dominated our life. Who or what is the “Humperdinck” that you have given your life to? Do you realize that it can’t satisfy? Do you realize that, if you are in Christ, sin is utterly powerless over you? Do you see Christ risen – not weak and recovering from an untimely death, but in power and victory as the conquering King? You see, sin is no brave conqueror. It is a cowardly, weak usurper who rules only by tyranny and trickery. The Great Tracker is not Prince Humperdinck, but the man who captured the princess—her lover. Thanks for reading! If you’d like to write for us, you can find out more about that here. An earlier version of this post originally appeared on Redeeming Culture’s ancestor site, Zoettrope, on February 20, 2012, but has been updated and edited for posting here. This entry was posted in Fantasy and tagged action, adventure, fantasy, gen con 2015, princess bride, romance. Bookmark the permalink.